Word of the Lenovo Vibe X3 smartphone surfaced before MWC 2015, so we were expecting to see the device launch during the event. But we know that didn’t happen. Still, that doesn’t mean Lenovo has no plans of launching the smartphone sometime in the future. Case in point, the specs of the Vibe X3 have surfaced this week, giving us a glimpse of what Lenovo has in store for us in the upcoming months. 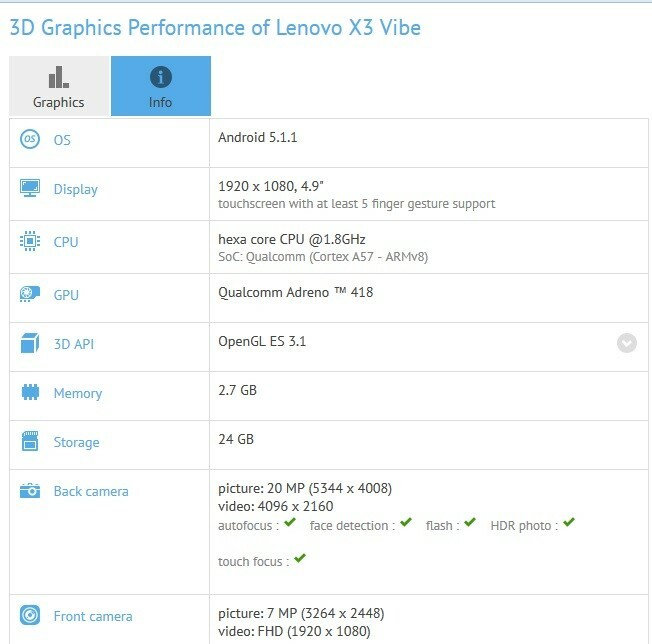 As revealed by Tech Gadgetsz, the Lenovo Vibe X3 popped up in the GFXBench database, revealing the full extent of its specifications in the process. It was previously believed that the phone would come equipped with a 5.5-inch display, but according to the new info, this is not the case. Apparently, the phone will arrive with a 5-inch IPS display with 1920 x 1080 pixel resolution, 441 ppi and Gorilla Glass 3 protection. Under the hood, we find Qualcomm’s Snapdragon 808 hexa-core processor clocked at 1.8GHz. It seems that Lenovo will abstain from using the Snapdragon 810 with this model, and this seems to be a good choice, considering all the reports of overheating issues concerning the chip. LG also took this path with the G4 flagship. The hexa-core chipset will be working in concert with an Adreno 418 GPU plus 3GB of RAM and 32GB of internal memory (expandable up to a hefty 128GB via microSD card slot). In the photography department, the phone takes advantage of a 20MP rear camera with dual LED flash, plus an atypical 7MP frontal facing camera for selfie taking. Android 5.1.1 Lollipop is the operating system du-jour (with the company’s own Vibe UI plastered on top), so if Lenovo launches the phone soon, you’ll be off the hook with updates until Android M comes along. The device is also equipped with 4G LTE, Wi-Fi 802.11 b/g/n/ac, Bluetooth 4.0 with A2DP and NFC. We’re also told the X3 should come with dual frontal speakers with Hi-Fi 3.0 software and a fingerprint sensor located on the back. From the looks of things, the Lenovo Vibe X3 will be one of the company’s upcoming flagships. Still, we have no clue when the Chinese device maker plans to unveil the handset or how much it will cost.